The Collection numbers more than one hundred and ten flags and covers the period from the beginning of the 19th century to the present day. Their visual identity reflects the changes that Serbia has undergone in the last two centuries. 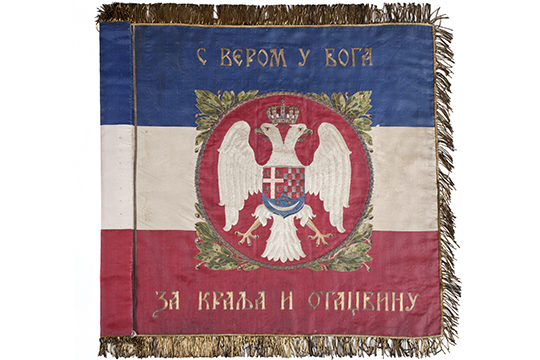 The most important part of the Collection includes the flags from the First Serbian Uprising, ranging from the personal, in various shapes and combinations of colours and with representations on them, via those of the regular insurgent army in 1809, to those belonging to the voivodes in 1811. Dating from the 20th and early 21st centuries, the rest of the Collection covers different state and party flags from the post-war periods, as well as those of numerous societies and associations, sports organizations, factories and companies, etc. A separate part of the collection refers to the masses of volunteers active after World War Two in the process of the reconstruction of the country, and contains over 40 flags, pennants and banners of numerous youth brigades. The organization of voluntary work, necessary after the war, was later redirected into the ideological formation of young people. The creation of a collective consciousness influenced young people to join numerous youth labour camps throughout the territory of the former Yugoslavia. Another separate part of the collection consists of the flags of the different parties which appeared on the Serbian political scene on the eve of the 21st century. These political organizations gathered their followers and supporters together and took part in numerous manifestations, demonstrations and rallies that marked the re-establishment of a multi-party system in Serbia. 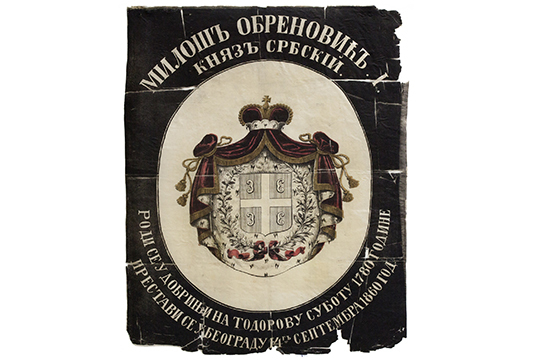 Of particular interest are the obituaries on silk which in the 1840’s became part of the funeral ritual of the most prominent figures of Serbian society. The funeral customs of the ruling class in Serbia were taken from the funeral ceremonies of the Hungarian aristocracy. Thus the obituaries of Princes Miloš and Michael, as well as of early deceased Sergei Obrenović and Svetozar Karadjordjević, are preserved in the collection.